Our congratulations go to Payam Yazdan-Ashoori, Honors BMSc, for winning one of only two Governor General's Medals presented at The University of Western Ontario this year. This award goes to the graduating student with the highest standing in any four-year honors program. Helen Kirsty Alexander, who graduated with an Honours BSc was the other recipient. Both medals were presented at the Faculty of Science and Schulich School of Medicine & Dentistry Annual Awards Ceremony on June 12th. Payam will start medical school at Queen's University in the fall. In the meantime, he's an instructor at a teaching agency that helps students prepare for college/university. His clients are in good hands. 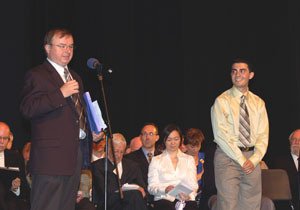 Payam was on the Dean's Honor List every year, graduating With Distinction. He also received the J.A.F. Stevenson Gold Medal for achieving the highest average in Honors Physiology.